You’ve probably noticed the stickers on food, those labels on fruits and vegetables with printed numbers and didn’t know what is their purpose. These are products that are imported and if you thought that these codes are used for the markets purpose, you are wrong. These codes are bar codes, these codes have a very important role. This labels contain so called PLU Code (price look up) Code that determines in which group certain products belongs. This is actually a number that shows how the product is grown. Plum code was introduced by marketing association for food and today is present on more than 1,500 types of products. This coding system was launched in United States in 90′ and later was expanded, first in New Zealand and then in European countries. PLU Code consists of 4 or 5 digits – located in the form of a small sticker placed on each product. Through code you can learn how the product is grown, is it genetically modified, it is organic, or is it grown using pesticides etc. This type of coding is not prescribed by law, it is voluntary. More and more manufacturers, especially those who grow organic food, recognize the importance of these stickers. If Plu Code contain only 4 digits, that means that the product is grown on traditional way, conventional way, with usage of pesticides. 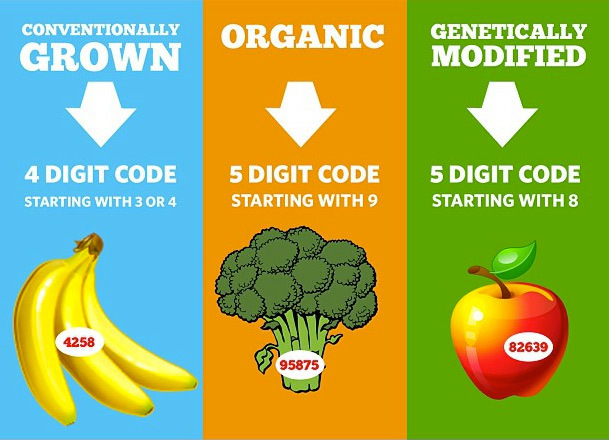 If Plu Code contain 5 digits and starts with number 8, that shows that the fruit or vegetable is genetically modified. GM food brings a lot of potential dangers for our health. GM food need to be avoided. If Plu Code contains also 5 digits, but starts with number 9, that shows that the product is organic. So, next time when you are buying fruits and vegetables, remember to take a look for a labels and now when you know their meaning, choose wisely.